Social media is one of the most important aspects of a flower shop's marketing strategy. socialmediatoday.com is a great tool to stay on top of the best practices for each platform, and to keep track of which platforms are most beneficial to your company. The Flower Pot is present on all the best traffic driving platforms, such as Facebook, StumbleUpon, Youtube, and Pinterest. Twitter, of course is a big part of our marketing strategy. We are currently approaching the 2000 follower mark! 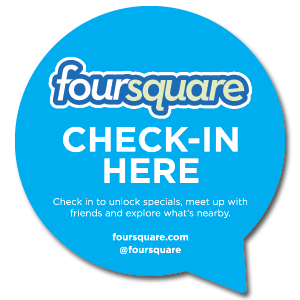 Right now our most interesting social media tool is Foursquare, because we currently have a special running! You get a $10 discount on the $25 Sunflower Bouquet when you check in until August 15th, 2012! Sign up now, LIKE US, and get active on social media!